Biography: Aubree Gustafson began her swimming career at the tender age of three at the local YMCA before joining the David Douglas Swim Club at age seven after some prodding from her best friend. Over the years she swam and played water polo for David Douglas High School and also for the Oregon State University women's swimming team and club water polo team. After graduating from OSU with a BS in Biology, she went on to earn a MS in Biological Sciences from The University of the Pacific in Stockton, CA. 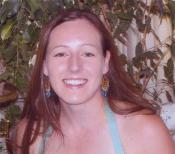 Aubree returned to competitive swimming as a member and assistant coach of the Oregon Wetmasters in the fall of 2006. Aubree has over fifteen years of competitive swimming experience and more than ten years experience teaching private and public lessons to swimmers of all ages.